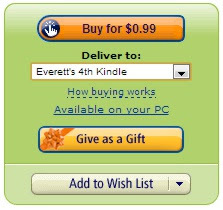 everett.peacock.com: GIFTING eBooks into the FUTURE! Yes, I just discovered this myself: you can GIFT ebooks to your friends and family...out into the future. While my 99 cents April promotion is on you can purchase Aunt Bee's birthday present now, even though her birthday is in October. Click on that and you'll see where you can enter an email address and A CALENDAR DATE for DELIVERY later! SWEET! Get your shopping done now while the price is right. Aloha!